The Great War Archive contains over 6,500 digital items contributed by the general public between March and June 2008. Every item originates from, or relates to, someone's experience of the First World War, either abroad or at home. Contributions were received via a special website and also through a series of open days at libraries and museums throughout the country. The model developed by the Great War Archive has since been used by other initiatives. We are currently working on the Europeana 1914-1918 project to gather further stories and memorabilia from the First World War. Anyone who wants to share their stories or images can do so via the multi-lingual website at http://europeana1914-1918.eu. Public open days are being held across Europe. The original Great War Archive initiative accepted contributions until June 2008. After that, people have been invited to share images that they have by posting them to The Great War Archive Flickr Group. To post to the group you will need to set up a free Flickr account. Many thanks to all those who have contributed to this initiative and assisted in our open days. My Angel last night I received a letter from you. I learned how strong was the pain on the day we had to separate. Do you remember those beautiful kisses? Do you remember the last one we gave each other between the tears. You did not dare to say a word. The tears were suffocating you. While passing by you were at the window. The [train] guard also told me that. I didn't see you. I almost thought you didn't keep the promise made. I didn't dare to watch more than once. My poor heart was suffocated not by tears, but by a strong passion that I couldn't resist. You knew what my beliefs were. Also having to leave you again, what a pain... By the end of the year we hope this will end... Greetings and kisses Giuseppe. Enjoy this souvenir from me. In these rough mountains you can find these flowers. 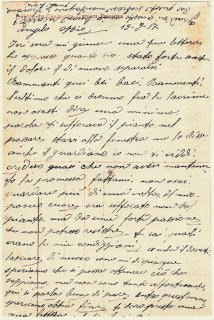 This moving love letter was sent by Sergeant Major Giuseppe Castellani, to his wife Antonia at home in Fossato di Vico, while he was away serving in the Italian army during the First World War. 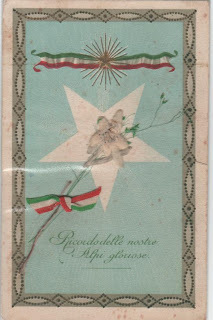 All her life Antonia cherished this edelweiss card, which was contributed online to Europeana 1914-1918 by their grandson Manuel Castellani. You may also contribute your family's stories from the Great War. View the full story and the images here.